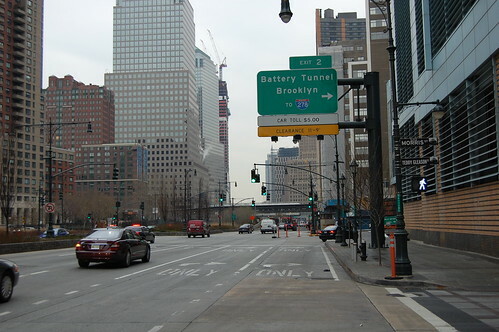 Interstate 478 is an unsigned designation for the Brooklyn-Battery Tunnel, which connects Lower Manhattan with Brooklyn. The tunnel is approximately 1.75 miles long; the Interstate, which includes approach ramps, clocks in at 2.14 miles. I-478 is one of those rare three-digit interstates which does not connect to its parent route (Interstate 78), yet it does connect to another 3di of the same parent (Interstate 278, on the Brooklyn side). The route number was chosen because initial plans were to connect the tunnel underground to the Holland Tunnel, which carries I-78 across the Hudson River to New Jersey.